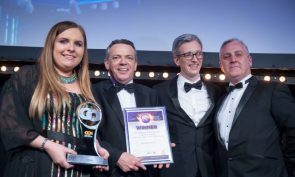 We have been honoured among the UK procurement community’s finest at the 2018/19 national GO Awards, where we won the Leading Practice Award for our Indexation work. Our Domestic Furniture and Furnishings Framework that helps councils provide goods to vulnerable residents, also received Highly Commended for Sustainability. Julie Welsh, our Director, said: “We developed our indexation tool to track each of our contracts against market cost drivers, and I am delighted that it has been recognised at a UK level for leading practice. The Domestic Furniture and Furnishings framework was recognised for its positive social, economic and environmental impacts, receiving Highly Commended at the UK awards after a win in the Sustainability category at the Scottish GO awards last year. The UK National Government Opportunities (GO) Awards recognise public sector procurement excellence, celebrate the role public, private and third sector organisations play in supporting the delivery of public services and are the benchmark by which progress in public sector commissioning is measured.